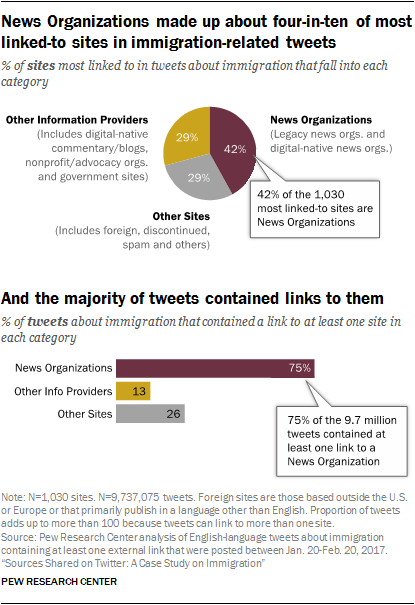 Broad category and specific grouping: The different kinds of sites linked to in immigration-related tweets were grouped into three broad categories: 1) News Organizations, which include legacy and digital-native news organizations; 2) Other Information Providers, which include digital-native commentary/blogs, nonprofit/advocacy organizations, government institutions/public officials, digital-native aggregators and academic/polling sites; and 3) Other Sites, which include consumer products and internet services sites, foreign/non-English sites, spam sites, discontinued sites, content delivery tools, celebrity/sports/parody/satire sites, and other sites. News Organizations (category): Sites in this category all showed evidence of original reporting (such as interviews, eyewitness accounts or referral to source documents) in the top five most linked-to articles on Twitter during this time period and the top five articles on their homepage when coding. 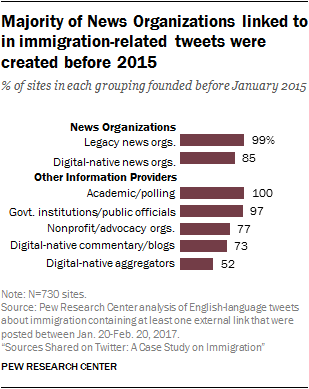 Other Information Providers (category): Sites in this category were focused on current events or public affairs information but are not news organizations. 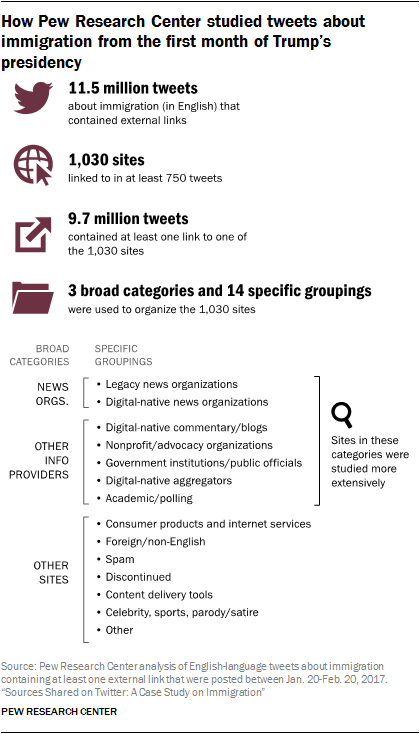 Other Sites (category): Sites in this category did not provide current events information or else could not be coded. Age: The date the site began posting content. This variable was coded for those established before or after Jan. 1, 2015, to capture sites that were created before the 2016 election season. Self-described ideology: A site’s specified ideology or partisanship ­– as stated on its “about” page, the about sections of associated social media profiles (any social media profile linked to on the about page of the site was included, with most sites linking to both their Facebook and Twitter accounts) or in interviews with site founders ­– was grouped into three broad categories: 1) liberal, including Democratic and progressive, 2) conservative, including Republican and 3) no self-identified ideology. Establishment orientation: A site’s specified orientation toward the media or political establishment, as stated on its “about” page or associated social media profiles. Sites that say, for example, that they are “exposing the lies of the media” or “taking the fight to the political establishment” are categorized as anti-establishment.